-Why would you ask such questions at a fansign..
-Who is Hyunuk? 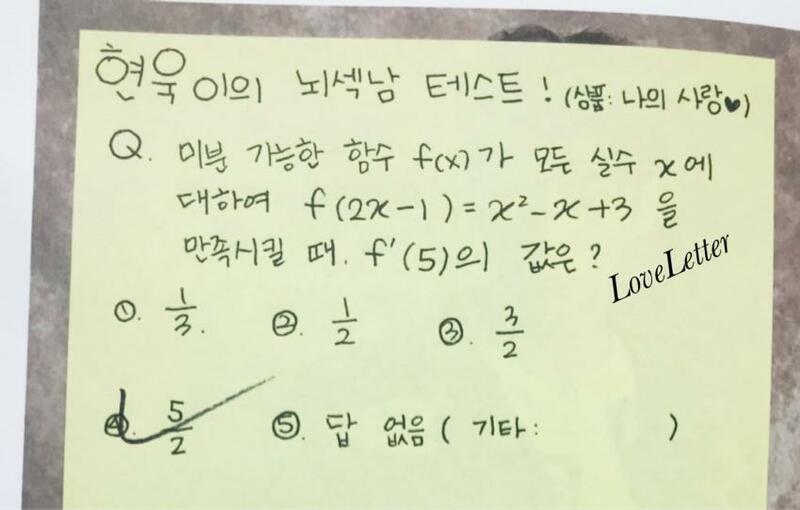 Anyway, it must've taken quite a long time to solve that questions in a fansign.. The other fans might feel uncomfortable..
-Why would you ask such question at a fansign;; Don't you have anything better to ask? -I think it's because Hyunuk is majoring in engineering.. Anyway, it's just a basic problem so he won't be having difficulties to solve it. It doesn't take much time either, why are you exaggerating things..
-Who is Hyunuk!!!!!!!!!!!!! Who is he!!!!!!!! I'm curious!!!!!!!!!!!!!!!!!!!! -Can someone tell me who Hyunuk is..
-I don't even know which group is Hyunuk in, can someone enlighten me..
-If you're posting this to promote Hyunuk then you should've added pictures of him in the post.. I wonder how does he look like..
-Seems like that fan did that because they wanted to upload it on internet..
-Hyunuk.. Ok, I'm gonna remember his name.. 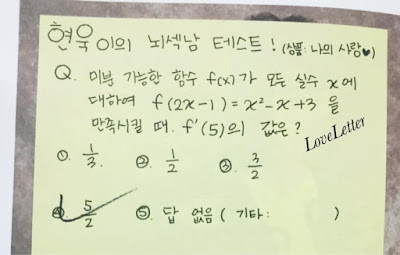 He's cute..
-Even high school students majoring in social and liberal arts can solve math problems like that..
-He's cute..ㅋㅋ It would be really nice if he gets invited to Problematic Man..